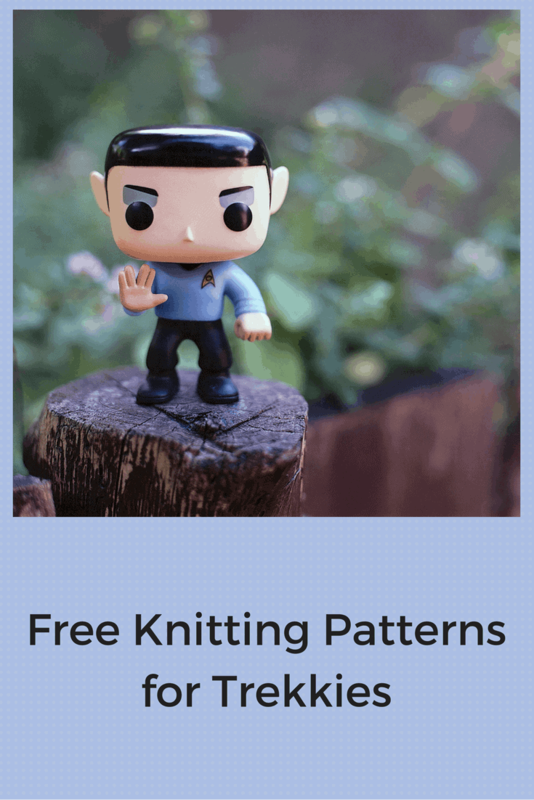 I sought out free knitting patterns for Star Trek projects simply because the latest movie has created an entire new generation of Star Trek fans in my house. Judging from the reviews and the word on the street, “Star Trek” has a legion of new Trekkies, and toy stores are busy stocking shelves for this latest take on some familiar characters. Creating a Star Trek version of nearly any knitting item is pretty easy–a blanket, hat, sweater–simply by sewing a Star Fleet insignia onto it. But shake things up a bit, and use one of these patterns and make an entirely new creation for yourself or the Trekkie in your life. This pattern for a Star Trek insignia washcloth is easy and quick. Knit several for a baby shower gift, and pair them with bottles of baby wash. Obviously, only do this if the parents are Trek fans. This washcloth is sure to elicit smiles, and an eye-roll or two from the grandmother-to-be. If your dad or husband is a fan, check out a similar pattern adapted to a pair of socks. I just love these “Little Dude” amigurumi dolls. Use the basic pattern (found at the top of the page), along with ideas for accessorizing. Chapman shows Star Trek characters from one of the TV shows, but the pattern easily adapts and it’s simple to include icons like Spock, Kirk, and even Khan. If you get good at it, knit the whole crew of the Enterprise, and how about all of the X-Men too. How much spare time do you have? Some might take this pattern as proof that Trekkies are not completely sane, but I’m a big fan of crazy, fun knitting patterns. This pattern for Spock ears is no exception. And, hey, they can be practical too. If you’re not too embarrassed to wear these out in public, they make great ear warmers. This pattern, on the other hand, is what happens when you watch too many Star Trek television spin-off shows. Neelix was enough of a strange-looking guy, with enough hair to knit with. If I were to make this sweater, I’d at least extend the cowl to make a hood. This darling little romper is perfect for a baby in a Voyager-loving family. Many, many Star Trek knitting patterns involve colorwork knitting. If you’re less than confident in your colorwork skills, check out Craftsy’s fantastic online course Modern Stranded Knitting Techniques. It’ll have you knitting colorwork like a pro! With these Star Trek knitting patterns, you can boldly go where few knitters have gone before. Love the patterns and the links . Thank you. But as a diehard Star Trek fan, I must correct you . We are TRECKERS ,not Trekkies.